Same formula from the original priority powder formula. the vegetable capsule is a vegetable process with no animal product. 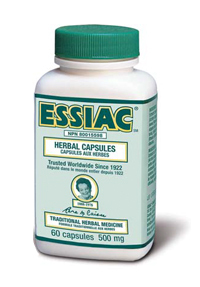 The capsules are filled with the extract original priority essiac powder formula. This process requires many steps and the capsules are standardized. SUGGESTED USE:For adults, take 2-4 Capsules twice daily, preferably one hour before of after meals. As a reminder, discuss the supplements and medications you take with your health care providers. The bottle will last 1-2 weeks if taken as suggested. WARNING: Not to be taken during pregnancy, by nursing mothers or by children under 10 years of age. KEEP OUT OF REACH OF CHILDREN. STORE IN A DRY PLACE AND AVOID EXCESSIVE HEAT. TAMPER RESISTANT; DO NOT USE IF SEAL UNDER CAP IS BROKEN OR MISSING. t = Daily Value not established.